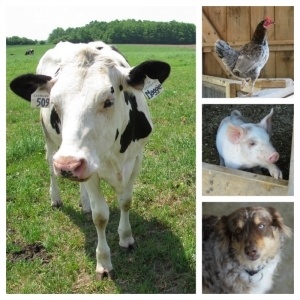 Here are some of the happenings on the farm in May! 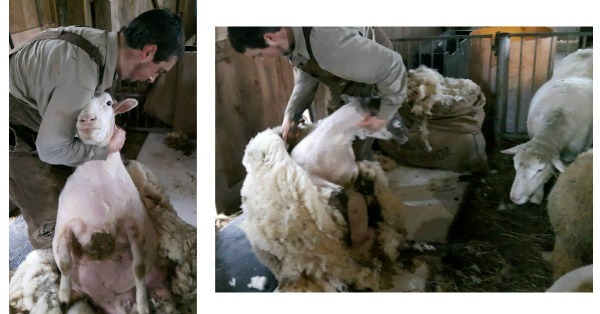 The month of May kicked off with the sheep getting sheared. Sheep at Mapleton's are raised for their meat, and are not bred for their wool like the Marino sheep in Australia. Because of this, their wool is of poor quality and Martin will not be using it to knit mittens anytime soon. The shearer purchases the wool from Mapleton's and most is then sent to China. The baby chicks arrived this week - the first week of May. These will be raised for meat rather than egg laying. For the first couple of weeks or so they will be in a corner of the main barn with the cows. Once we finish Spring cleaning the demonstration barn they will move there. When they have feathers and are big enough they will go outside. 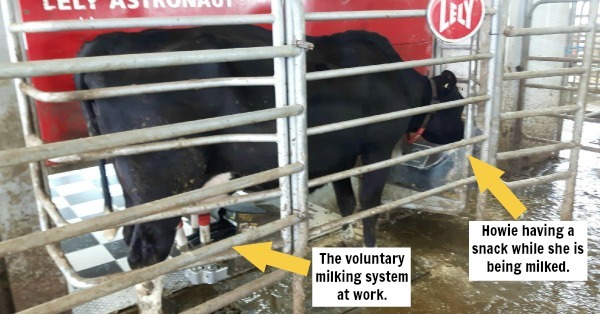 The voluntary milking system provides us with a wealth of information on each cow. We thought we would profile one of the cows as an example, and we picked Howie. Howie is one of the highest producers these days. She is a second lactation cow and was born on Dec 28 2013. These statistics come up for all of our cows. If any of the numbers are abnormal then those cows are noted on the "attention" list in the system. For example, somatic cell count is used to monitor for mastitis - which is an inflamation of the mammary gland (called udder). 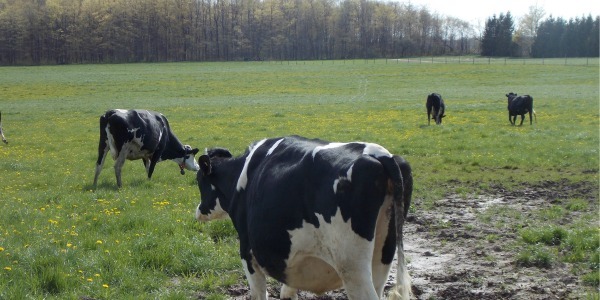 If a cow has an elevated white cell count it is indicating she is fighting an infection. If you would like to learn more, here are some additional blogs you might find interesting. Sometimes when cows calf they get milk fever. It occurs in approximately one out of every 20 births. 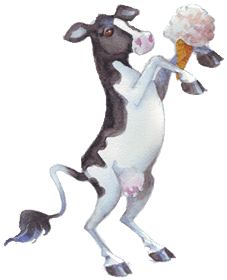 This is an acute shortage of calcium in their blood which makes the cow get weak and cold and cannnot get up. 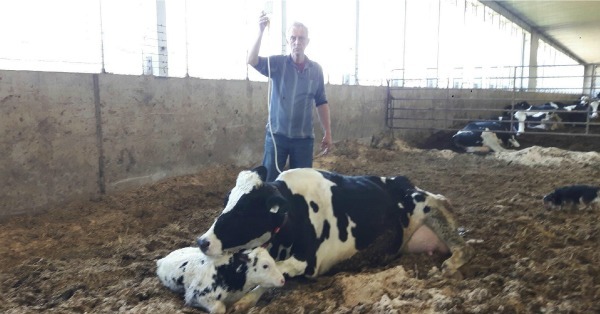 It is caused when the cow makes a lot of colostrum all of a sudden and her system can not keep up with retrieving calcium fast enough from her system. Milk fever is fairly easy to treat with an infusion of calcium into the cows bloodstream. The needle is inserted either in the neck artery or the milk vein at the bottom of the cows belly in front of the udder. Usually after treatment, the cow will be up and eating again within half an hour. On May 11th, the pasture re-opened after being closed for the Fall/Winter. From now until the Fall, the ladies have access to the pasture. They are able to choose whether they want to hang out in the Main Barn, or spend time in the pasture. Visit here to see a video of the cows returning to pasture. From the middle to end of May a number of lambs will be born at the farm. 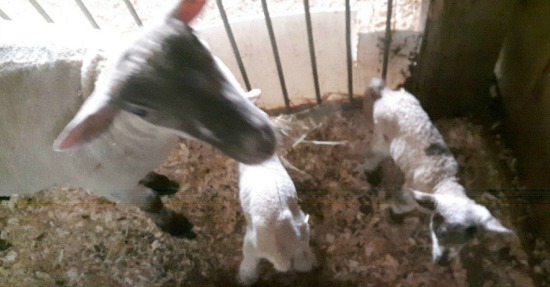 The lamb shown here in the photo was born on May 13th, and is about 4 hours old in the photo. She is in the demonstration barn, where people can visit her. The following photo was taken on Tuesday, May 16th when Martin took a break from driving the tractor and cultivating. The cultivating Martin is doing is for seed bed preparation, so the soil is loose and fine to allow the seeds to germinate properly and evenly. 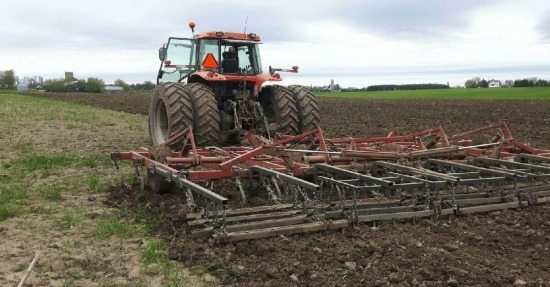 At the back of the cultivator you can see levelling harrows to help even out the ground after it has been cultivated. This field is 50 acres, and it takes Martin about 5 hours to cultivate it. Next week it will be planted with black turtle beans, a crop that will be sold for human consumption. They are not easy to grow, but are a profitable crop. A new day, new week and new life. To start off the week of May 22nd, Georgia delivered a healthy boy and girl. Georgia is the sheep that Arwa raised a couple of years ago in her house. 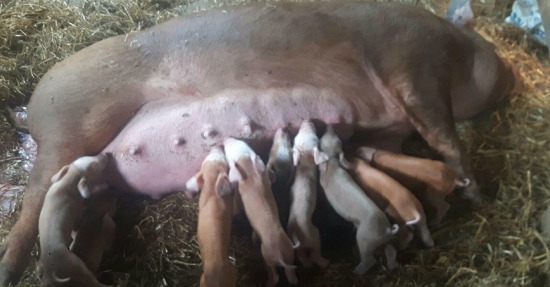 Also in late May we are welcoming 9 colourful piglets to the farm! They and their mom are Berkshire pigs. It is an old British breed, good mothers, smaller litters, more resilient, good for pasturing and colourful. The first few days the piglets receive extra attention, as this is when they are at risk for being laid on by their mother. Martin and others monitor them, and keep them in a separate pen with a heat lamp when they are not drinking from their mom. After a couple of days they figure things out and will remain with their mom full time. The piglets and their mom call the Demonstration Barn their home for now, and visitors are welcome to come by and see them! 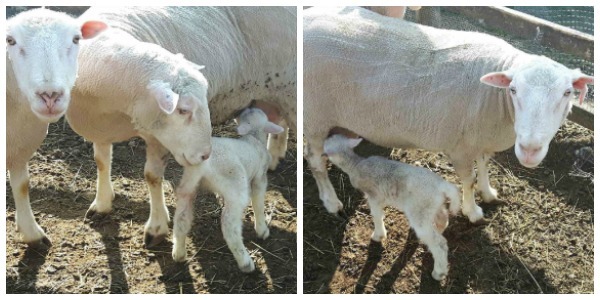 If you missed the April Life on the Farm blog you can check it out here.